For a democratic secular Iran. For peace and prosperity in the Middle East. : How Fake is this Passport? This video below is another IR state TV showing of Jamali Fashi's "last minutes" before being executed. 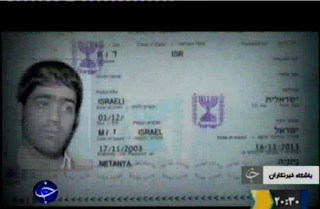 Here they claim he was given an Israeli passport with a different name. There are several things that don't add up. The date of issue is 17/11/2003, that is nine years ago. It was said that Jamali Fashi was 24 years old when he was "executed" last week. The passport picture however does not come across as that of a 15 year old teenager. In fact the picture is truly a give away in many ways. No passport will be issued with such a picture, anywhere in the world. You need a headshot where you are open-eyed AND looking into the camera. This is yet another question in the whole series of doubts about what Jamali Fashi's role, if any, in the assassination of Iranian particle physicist, Massoud Ali-Mohammadi was. They used a picture of a sample Israeli passport from Wikipedia. also photo is recent not 15 yrs old! The year of birth has been erased and in the Hebrew line on the right it says "Israelit", meaning that he is (accoring to that passport) a "she"!! How cheap is that fake. In passport photo, the person should look directly to the camera. It is a rule everywhere. This photo is fake since this is not acceptable photo for a passport. this is a fake photo passport, so it is a fake passport. The passport holder should look directly to camera. what kind of passport is it? Obviously the still which has been posted here is fake and not the one shown on the clip. Have your IQs tested.